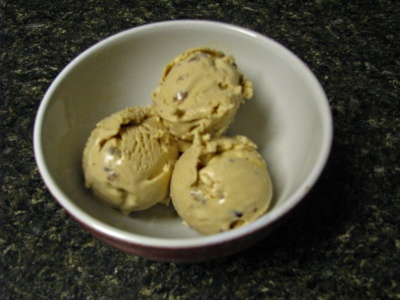 Homemade ice cream was one of those items that pushed me into making things from scratch. A few years ago my wife bought me an ice cream maker for my birthday: I tried a bunch of the recipes that came with the machine but they didn’t turn out. My new toy became my white whale, haunting and mocking me every time I opened the cupboard. Then I came across David Lebovitz‘s blog and everything changed. He has a great recipe for vanilla ice cream that I tried and immediately fell in love with. It’s very simple and easy to follow: three steps and you’re done. I made it a bunch of times and was so successful on every attempt that I picked up his book from Amazon a few weeks ago, The Perfect Scoop. I was looking for my favourite ice cream: butter pecan. This past weekend I made it, photo above (sorry about the blurriness: it was late and I wanted ice cream). After reading his book and the article he wrote for Fine Cooking this month classic ice cream in all it’s flavours basically follow the same vanilla recipe but you change up the steeping flavour and the add-ins. The only downside to ice cream making is the cost of the ingredients: most recipes call for two cups of heavy (35%) cream and a cup of milk. In my area that’s $3 worth of dairy so don’t expect homemade to be cheaper than store bought. I was able to get 1L of heavy cream for $2.50 at a local retailer so I picked up ten and have been making ice cream every few days. Vanilla beans are another pricey item: about $3 per bean locally. I ordered a big back from eBay a while back and they were cheap and good quality; the internet saves the day again. The advantage of making your own ice cream is two fold: you know what’s in it and you know what’s not in it. Take a look at the ingredient list on that carton of ice cream in your freezer and see how many additives and stabilizers are in there: those are needed to keep it smooth and shelf (freezer) stable. And of course you can make any flavour you want.